Patio Bricks are Traditional, Classy and Easy! So you've made the decision that patio bricks are the perfect choice for your patio. What a great choice! Patio bricks are an excellent choice for a patio covering because they are relatively easy to install, can hold up to wear and tear, are easy to replace if necessary, and are resistant to chipping and cracking. 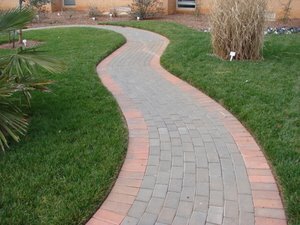 Once you choose a brick patio for your landscape, you still have choices to make. Patio bricks and blocks come in many different shapes, sizes and colors so you'll have to decide what will work best for you. Before you choose the block, be sure that you know what space you want to fill and try to pick a block that will easily fit into the space without a lot of cutting... this will make for easier installation. Typically, patio bricks and blocks are manufactured. They manufacture the bricks for cost savings and uniformity of the brick. They even create some bricks to simulate natural stone. Bricks are created to emulate natural stones with ridges, and tumbled looks, as well as the standard square edge brick you're used to seeing. Patio bricks are available in different sizes, from a rectangular size to square, to octagons, circles and even triangles. Of course, you can also find different sizes of rectangles and squares as well. With all the variety of brick, you can create almost any type of pattern in your patio that your imagination can think of. Patio bricks are easier to install than ever because of their uniform size and consistency. You will always know that the bricks are the same width and length making it easier to create square and level patios on the first try. When you begin shopping for your material, you will notice that there are bricks and blocks. The difference between bricks and blocks is simple. Bricks have holes in them. The conventional brick has nine holes and comes in either a tumbled edge or a square edge. The bricks can be found in different widths and over thirty different colors. No matter what type of patio bricks or patio blocks you choose, you are sure to find something that complements your yard and your landscape design. Patio bricks and blocks create a stunning and long lasting outdoor living space.